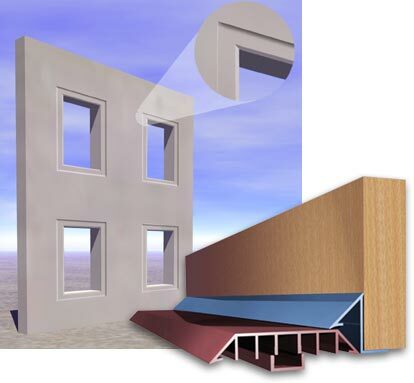 Victory Bear Recessed Window System adds a classic design detail to concrete walls around windows and doors. The system consists of our Recessed Window Chamfer and a standard Victory Bear Rustication/Reveal. PVC virtually eliminates concrete pitting caused by wood-wicking. It also eliminates discoloration caused by wood sugars. It almost entirely eliminates the need for grinding and patching, saving you man-hours or subcontractor expense. With Victory Bear there are no finish blemishes from screw heads or excess glue. All screws and glue remnants are hidden under the surface for a sharp, glass-like finish. Easy to install – Three standard parts fit together easily to create sharp architectural details. Our patented Flexible Edge Seal fits tightly against the casting surface, preventing concrete seepage while creating sharp, crisp lines. Reusable – PVC is reusable and strong. It won’t deteriorate with routine use like other materials.